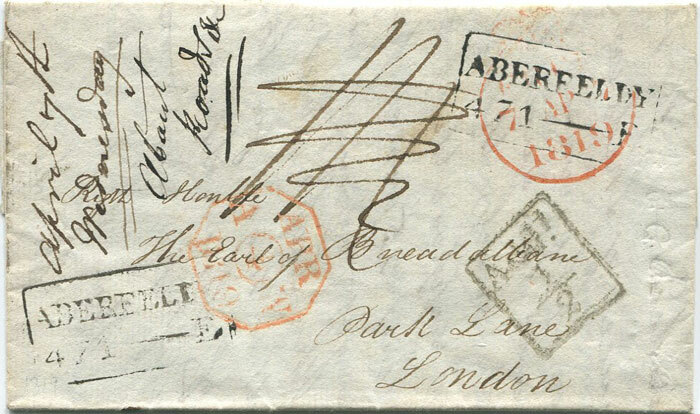 Below is my current stock which is mostly of West Indies stamps and covers. The newest items listed are shown first. You may also select a particular country from the drop down list or do a search by subject. 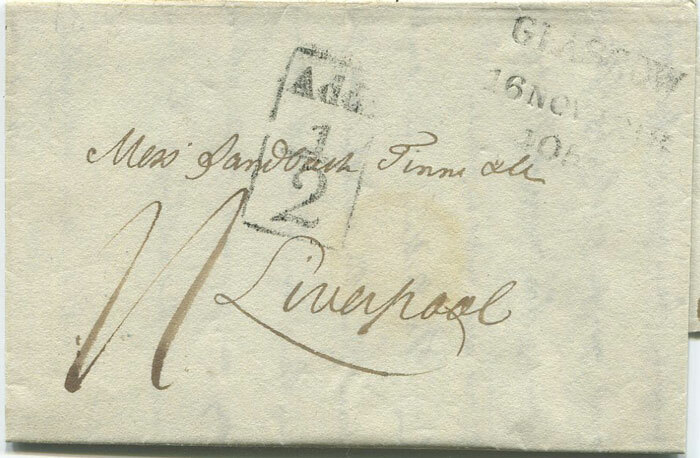 Post and packing is extra but does not increase however many items are ordered. Inland £1, Europe £1.50 and Overseas £2. 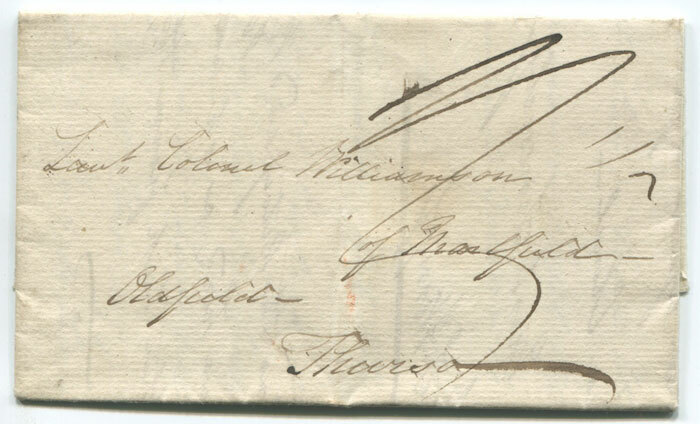 1799 COVENTRY handstamp and inspectors crown on EL to London. London code F cds on reverse. Rated 1/- and re-rated 1/6d. 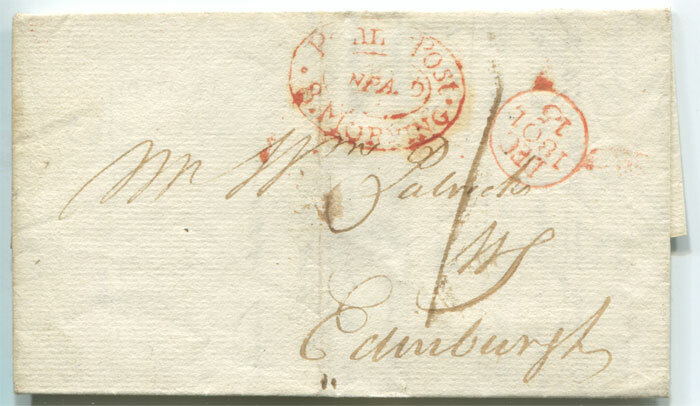 1801 (15 Dec) Penny Post 8 Morning Unpaid oval h/s in red on local Edinburgh cover. 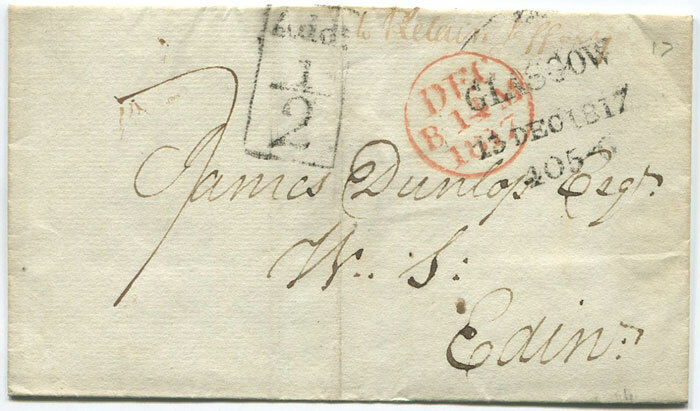 1803 (29 Nov) EL with Edinburgh Penny Post circular 4/PP/O.CLOCK h/s in red. 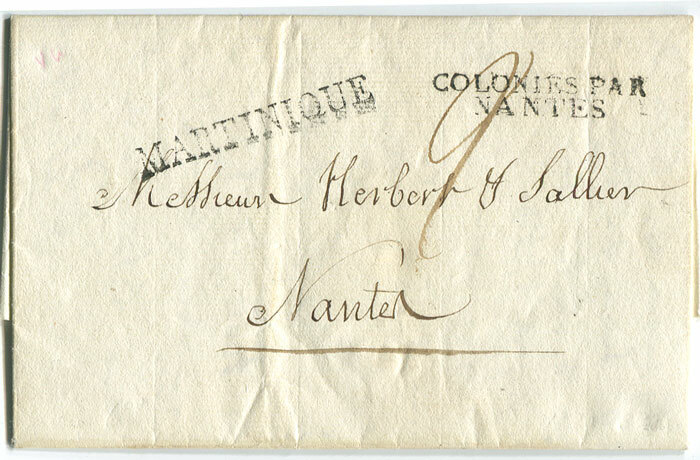 1805 (20 May) EL from Fort Charlotte, St Vincent to Lieut. 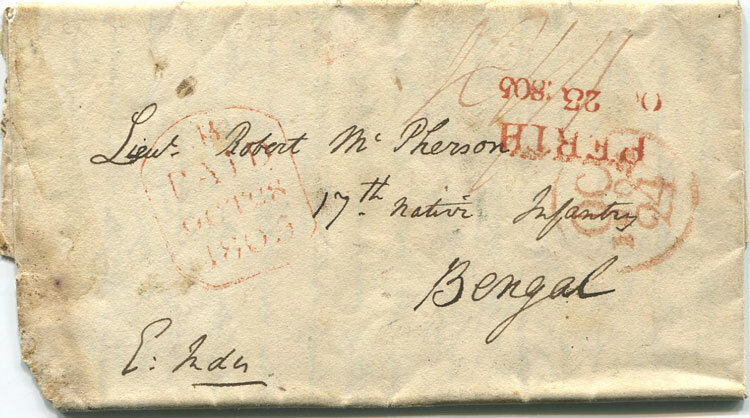 Robert Mc Pherson, 17th Native Infantry, Bengal. Apparently carried privately to Perth, Scotland where posted to India with PERTH ds, Edinburgh Bishop Mark and London PAID ds. 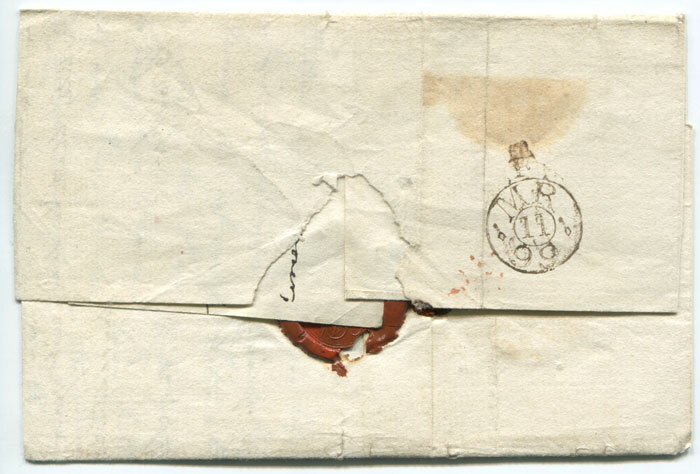 Worn at folds and with hole at lower left corner. 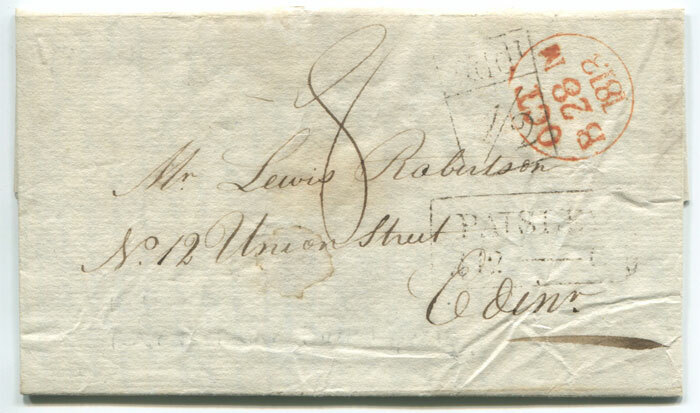 1810 straight line JOHNSTONE on cover to Glasgow. on EL to Edinburgh also PAISLEY mileage mark. (H/S3) on EL to Hawick. 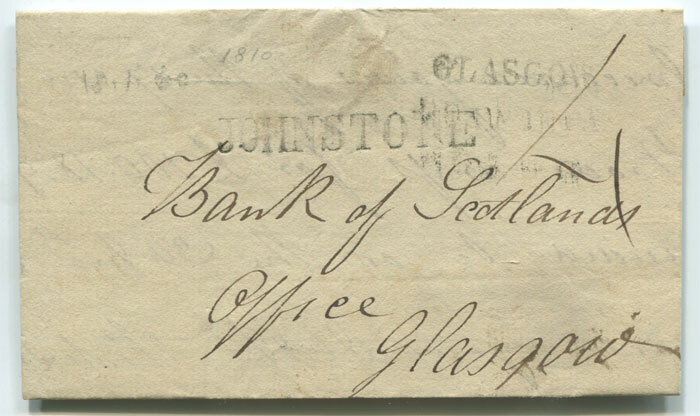 1816 GLASGOW boxed ADD ½! mark on EL to Edinburgh. 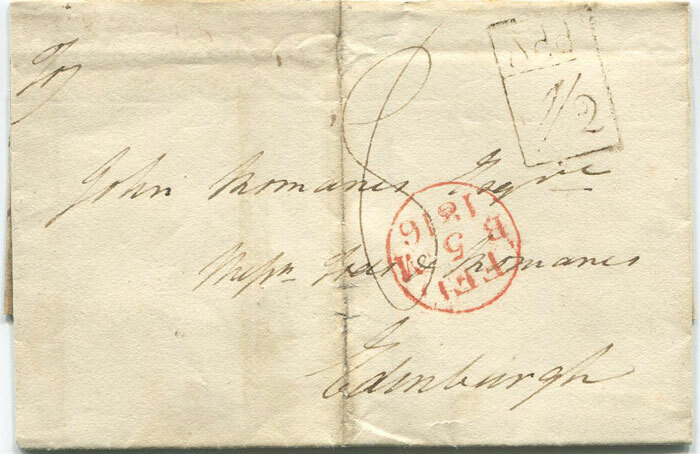 1816 (3 Feb) PAISLEY boxed Add ½ on cover to Edinburgh. (H/S110). 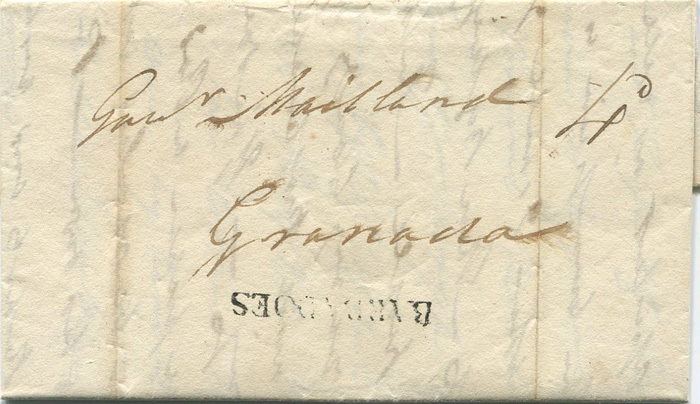 Straight line 'JOHNSTONE' on reverse. 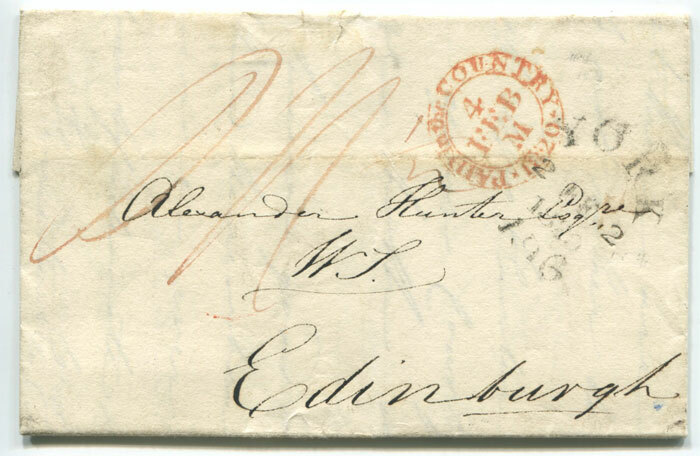 1817 (3 Feb) STONEHAVEN 513 E boxed mileage mark on EL to Thurso. 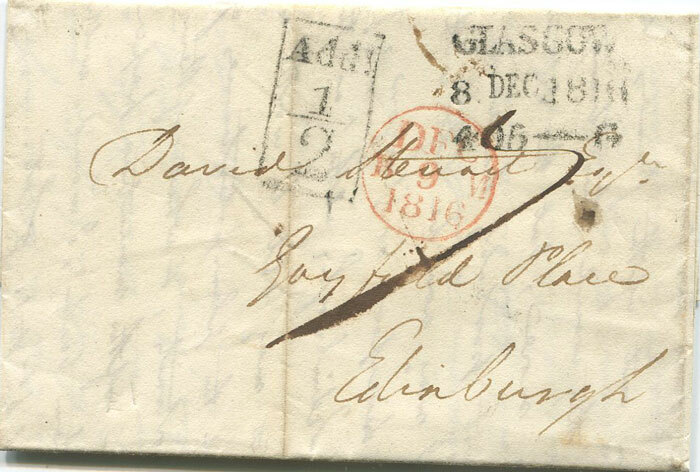 1817 (13 Dec) GLASGOW boxed ADD ½ mark on cover to Edinburgh. 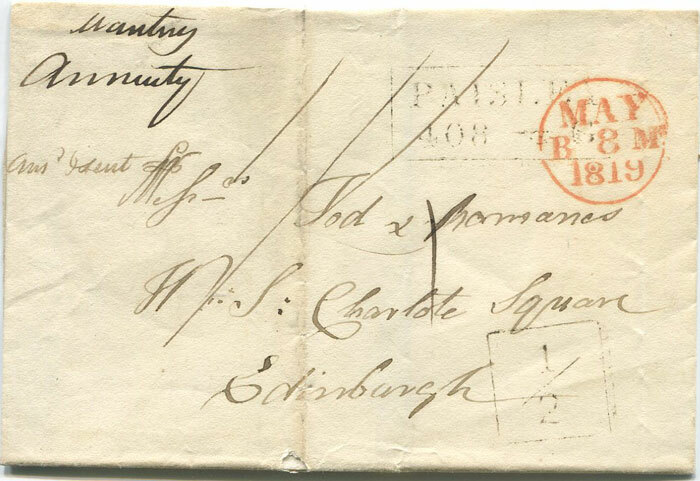 1817 (13 May) PAISLEY boxed Add ½ on cover to Edinburgh. 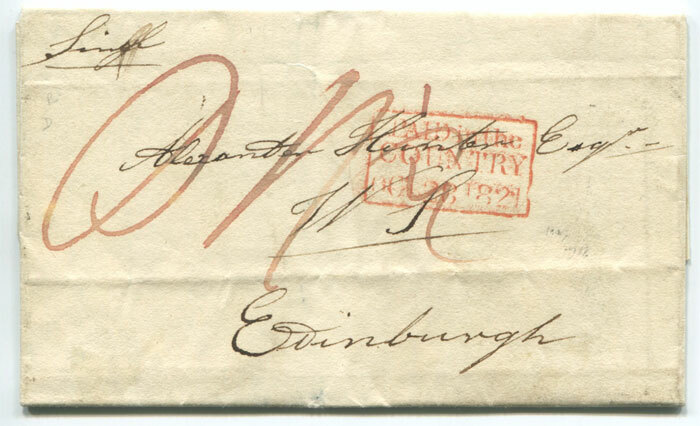 (H/S111) on cover to Edinburgh. PAISLEY 408 - G mileage mark at left. 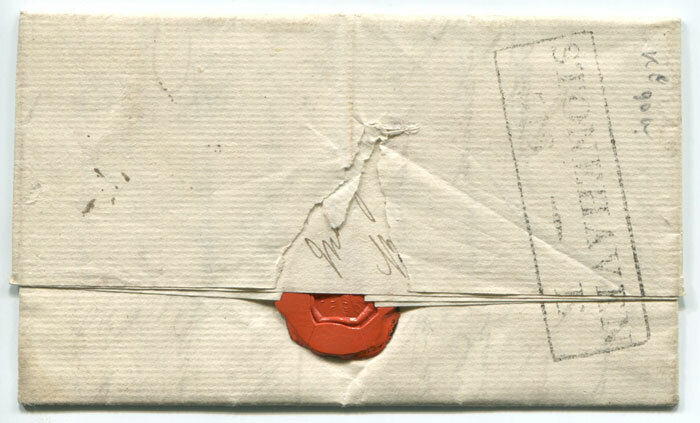 on cover to the Earl of Breadalbane in London with light Edinburgh boxed Add ½ (H/S18) struck in error as letter entitled to the franking priviledge and with crown Free mark in red. 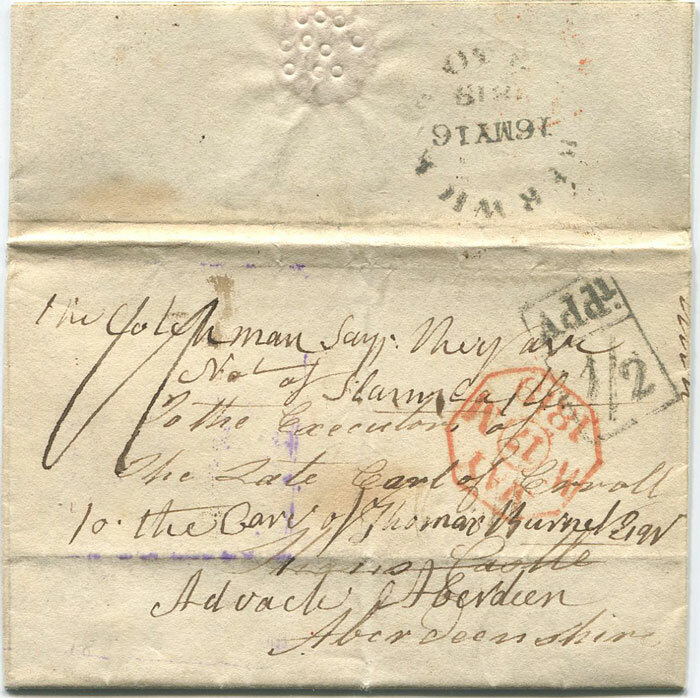 1819 (16 May) BERWICK boxed Add! ½ on EL to Aberdeen. (H/S 156). 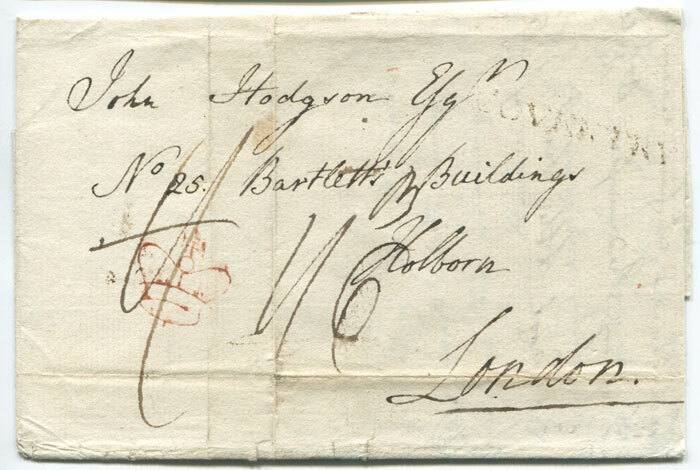 Berwick mileage mark on reverse. 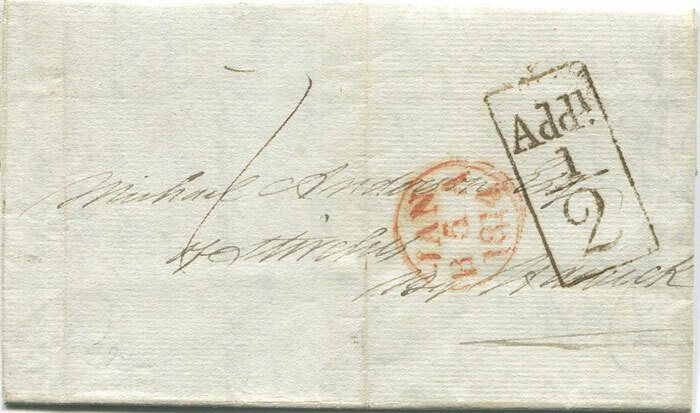 1820 (2 Dec) YORK 196 mileage mark and 'PAID in the COUNTRY' double circle cds on EL to Edinburgh. 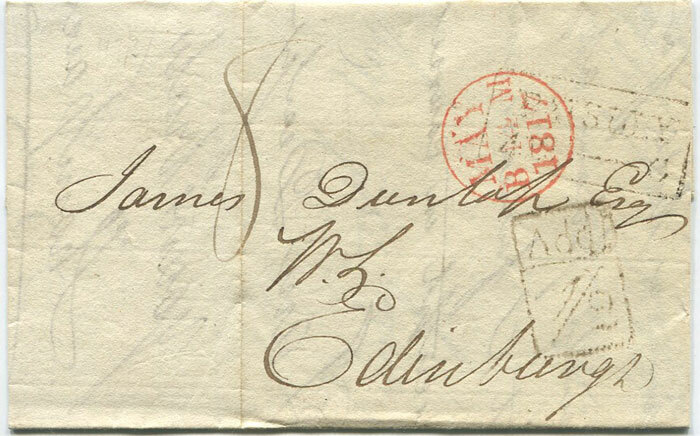 1821 (26 Oct) YORK 196 mileage mark and 'PAID in the COUNTRY' boxed ds on EL to Edinburgh.